Talk about edging your bets. 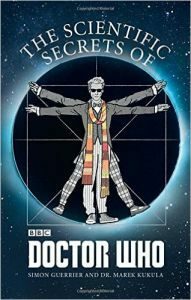 ‘The Scientific Secrets Of Doctor Who’ by Simon Guerruer and Dr. Marek Kukula cross-matches real science with a certain Time Lord’s TV series, all 813 episodes up to February 2015 and then includes 15 new short stories from various authors, interspersed between the chapters in case readers get bored with that. As I tend to think of Who fiction away from the TV series an non-canon anyway, this does tend to feel more like unnecessary padding. Do Who fans need anything other than knowing this is a book related to their pet subject to buy this book? I doubt if even the word ‘science’ would scare them that much. At least, I hope not. I should point out some information from the back of the book that should certainly have been put at the front. Namely, they did not want to cover the same material as Paul Parsons’ book, ‘The Science Of Doctor Who’ (Icon, 2006). As I haven’t read or reviewed it, I’ll have to take their assurances that book covers sonic screwdrivers and deflector shields. Across the 15 chapters, you get a look at a lot of current scientific information about the cosmos, time problems, aliens and all other things that make up our reality from Dr. Marek Kukula and I suspect it is Simon Guerruer who fills in most of the detailed ‘Doctor Who’ connections and occasionally how close to prediction it was occasionally and accidentally, with ice-canos – volcanos that spout ice not lava in the 1973 story ‘Planet Of The Daleks’. One would have to presume that the planet’s core was hot enough to melt the ice sufficiently to cause the eruption and the atmosphere cold enough to re-freeze the water or you would have a giant icicle coming up and down on your head. Combined together you get a lot of knowledge on both subjects, as well as various quotes from the TV series and other information. Guerruer makes an interesting observation that there have been 16 instances of lookalikes of various characters, if you know your lore, then it’s the actors coming back in different roles. Not that I didn’t know that, just not how many. I think he might only be wrong regarding Clara Oswald simply because the Doctor might still bump into her other guises in different time periods in times to come but that’s all in the future (sic). After a while, especially me knowing my science, I did find myself paying more attention to, I assume it is mostly, Guerruer’s ‘Doctor Who’ knowledge for things he missed. In regarding to changing history, the Tennant Doctor does point out that that he knows when history isn’t being played out correctly and does what he does to adjust it to how it should play out. I would take Guerruer to task about the qualities needed to be companions to the Doctor. Current regenerations might be more selective on whom they travel with but the older regenerations had a haphazard selection, with several inviting themselves on-board. It’s inspired me enough to compile the data to have a proper look. As to the Doctor’s companions being chosen as the best for his travels, I would contend with him that several weren’t. Ian Chesterton and Barbara Wright were accidents considering they pressed the wrong buttons in the TARDIS to open the doors. Steven Taylor, Jamie McCrimmon and Leela followed the Doctor after he closed the door and were hardly openly invited as he was getting ready to leave as the TARDIS dematerialised seconds afterwards. Tegan Jovanka walked into the TARDIS thinking she could use its phone and was always eager to get home. Having companions that are at least technologically aware saves all kinds of problems when they arrive far into the future. Not all of this book is about hard sciences, there is also a look at human psychology and the ability to remember things. I’m less convinced that humans would forget alien invasions. One only has to look at how we remember the dead from the two world wars to realise that wouldn’t be easy, more so as many people are likely to do whoever the enemy is and books written on the subject. I’ve had a longer think about that and other than in the recent regenerations, the early 60s-80s Earth invasions weren’t exactly on a world-wide scale so that would curb some memories and was contained around the London area. I’d be more concerned about the Dalek invasion of 2167 because all the hard work the Doctor did up until then is practically wiped out and certainly didn’t prepare Earth for. As noted with recent regenerations, the humans had become too dependent on him rescuing them. The same also applies to companions with military training, after all, Jamie McCrimmon and Leela would have been classed as warriors. It isn’t as though the Pertwee Doctor didn’t take the Brigadier and Benton on one jaunt but they were pulled along by the Time Lords to sort out Omega in ‘The Three Doctors’ rather than by his deliberation. I suspect it isn’t the training that worries him but whether or not they will shoot first than negotiate. It isn’t as though the Doctor hasn’t resorted to killing himself from regeneration to regeneration, even if it was mostly as a last resort. You’ll notice I’m focusing more on the Who aspect but that’s largely because the science end covers a lot of aspects that I don’t have any problems with, although clearly time travel other than forwards isn’t possible because of entropy. When it comes to cyborgs, although I applaud the Cordwainer Smith example, they might have has a better choice with Frederick Pohl’s ‘Man-Plus’ for adapting to life on another planet by cybernetic surgery. So, let’s hit on the science. I’m a bit concerned about apples from the top of tall trees being missed from being eaten yielding more taller trees as that is clearly wrong. Regardless of the height grown, they all have to drop to earth or be eaten to spread their seed so that factor is irrelevant. I doubt if the seeds would carry the notion of height means success, especially as they don’t get digested. One thing they are absolutely wrong on is if you cut a worm in half, both ends will regrowor regenerate. This isn’t so and even the Net points this out. It’s only the ‘head’ end that does this and even that depends on where the cut is made. Don’t try this at home. Although I have been more critical on some parts, this doesn’t mean that this book is totally imperfect and there’s far more useful than not info within. It’s certainly given me some things to think about and that’s always a good thing. « Alien worlds spotted by NASA: life possible.